Oh my goodness...while writing this I suddenly realized that this is my 500th post. Five hundred times I have posted words & photos, five hundred times some of you have left a little love message, other times only a look-see, some of you have been with me since the beginning, some have just "found" me, but I am 500 times grateful for all of you that stop by. I began this blog journey when my husband was descending into the hell of Alzheimer's...something that gave me an outlet, a place to post my photos, a place to write a few thoughts. Some serious, some not so much. There are days I have no outside contact with anyone except you, but that's ok....I do not mind the alone times. So I will continue this blog journey, I enjoy posting my thoughts, and displaying my passion for photography. So thank you 500 times. I love cups....tea cups, mugs, all sizes, colors & shapes. One of the calendars I created and sold this year was entitled "Coffee, Tea & Me" and several ladies bought it with the thought of creating a gift-basket with a pretty cup, a variety of teas, & the calendar. So....because I love cups I am planning on doing a "cup a day" for the month of December. I have already missed the first 2 days of December, (didn't even think about it until today) but I did post one yesterday and here is the one for today. Join me in this "cup a day" by leaving a link to your blog-post in the comments. No, this is not a linky party....haven't a clue as to how to do that, and honestly don't have the time to figure it out. Just a fun thing to do for the holidays. I'll be doing this everyday, so if you want to join anytime, please do. And the tree is decorated...ta da. I love it. sweet Chrissmassy photographs Deanna and congratulations on your 500th post. Blogging is a lovely creative outlet and it's good for our souls, therapeutic even. Keep it up! Well done on the 500 posts. I often wonder what I did before blogger, lol. 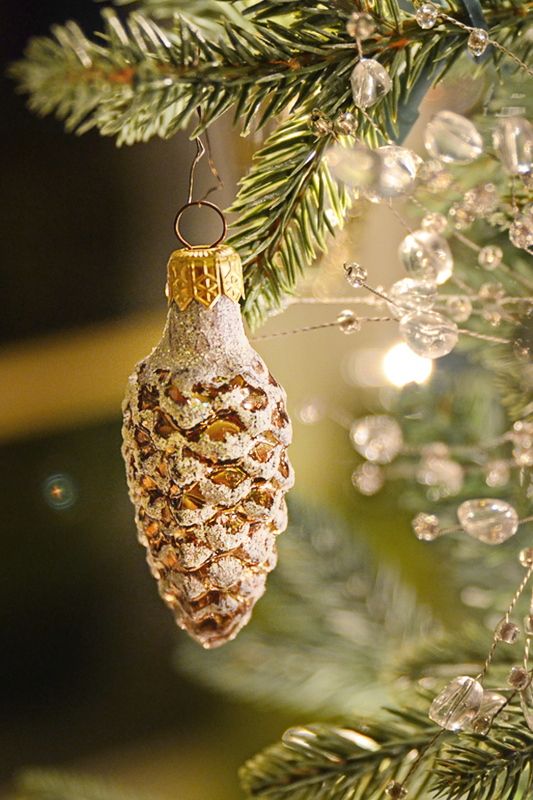 Your Christmas tree is looking beautiful as are your pictures. Here is to another 500 posts!!! What a beautiful tree. It is so sparkly and warm looking. It must be the pretty golds that make it so warm. Looking forward to seeing what cups you post. I like to hunt for them and every once in awhile I find one that must bring home. I try not to bring too many home, don't really have the room to keep a bunch. You are such an amazing artist! I love your cups and look forward to each one. 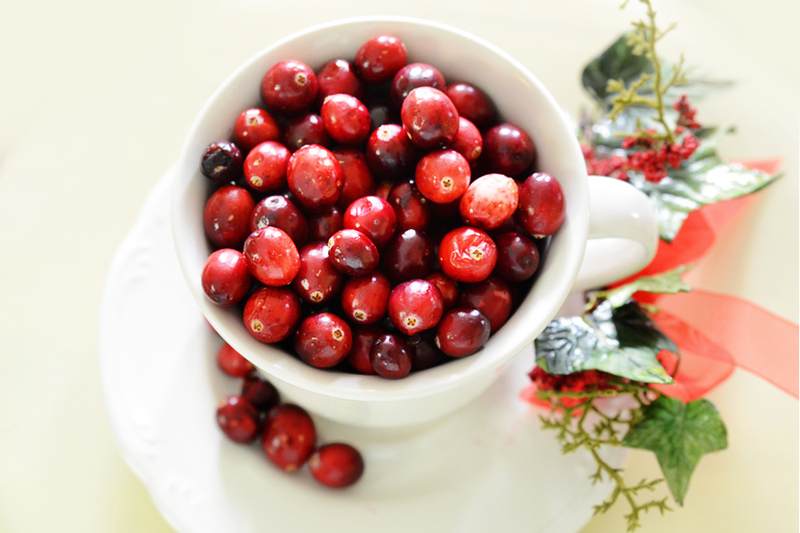 Gorgeous cranberries! Your tree is stunning, just gorgeous, congrats on the 500th post Deanna. I love the idea of a cup a day and your tree looks like it was 'deliberately' decorated as opposed to my hodge-podge approach. Congratulations on hitting 500. I, for one, am so glad you enjoy and plan to continue posting - you are so inspiring. congrats on the 500th post. i had to go & check how many posts i have written. i'm at 505 today ... so i will celebrate 506 tomorrow. so exciting now time flies. enjoy your day!! What a beautiful tree! and I love the cranberries in the cup. Congrats on your 500th post! And gorgeous photos! I LOVE your tree. Wow!! yay! Happy 500th post to you! What a fun idea-a cup a day! I'll have to give this some thought! 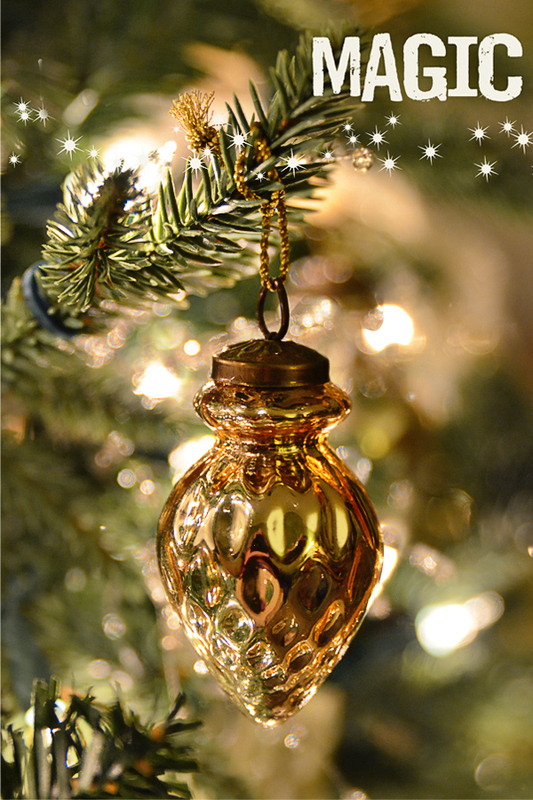 Did you see that little bit of magic bokeh you got in the picture of the ornament with no words? It's just floating out there and is so pretty with it's little star! How'd you do that? Yippee!! 500 posts! Wow. I'm glad I found you and always happy to read your posts and see your beautiful pics. Your tree is DROP DEAD GORGEOUS. makes me smile. Here's to another 500+ posts. Wow, 500! I've only reached 252..... ; ) Lovin' those cranberries and your tree is fabulous! Congratulations! Sorry I am so late to the party. Your tree is spectacular! Congrats on the 500th post Deanna, I've enjoyed all of them! 500 posts!! Well done, Deanna! I love your "cup a day" idea and that tree is gorgeous!! Congratulations on you 500th post, Deanna! I love your blog. Your words are insightful and your photographs inspire me. I can't wait for another 500 posts. Congratulations! Big milestone! And I love the cup-a-day. I'll be back with a link before the month is over. Congratulations on your 500th. Wow!! I have to say I'm impressed. I'll look forward to your cups and mugs. And, the gorgeous photos you'll take of them. Well happy 500th post to you.. I just might link up with your little cup a day. Your cup here is gorgeous. Your blog is a visual delight to visit Deanna, a place of sharing and inspiration. 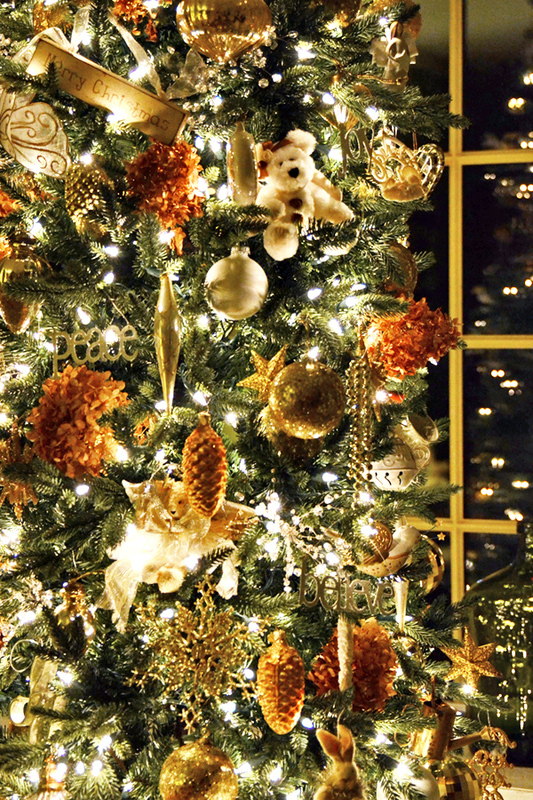 Your tree is stunning, beautifully photographed. I'm pleased to have been with you for much of the journey so far. Am loving your new header!!! So festive. At the end of each semester for my Developmental Psychology class I show the documentary The Forgetting. It is heartwrenching to watch but I need my students to understand what a devastating disease Alzheimer's is. God bless. Congrats on this milestone! Glad you are staying with it, as there are so many beautiful things here! Deanna, your tree is breathtaking. Beautiful. I love your cup a day idea. Unlike you, I do not have a collection. Hmmmm, should I begin one?